Revising your manuscript is arguably the most difficult step towards publishing your novel. Without a solid game plan in place, you can easily become overwhelmed, frustrated, and doubtful...which may even lead you to tuck away that manuscript for good. The key to achieving self-editing success lies in understanding the three types of editing and creating a game plan to see them all through. I know what you're thinking. "Three types of editing? You mean there's more than one?". Yep, that's right. But I promise you don't need to start stressing out just yet. We're going to break down each of these three types of editing in full detail in today's post. Ready to get started? This first type of editing is developmental editing, which consists of the structural changes you need to make to the actual content of your novel. In other words, you have to work through each element of your story to determine whether they should stay or go, or whether or not they need a bit of an upgrade or overhaul. The elements you want to revise in particular are your plot and character arcs, characterization and development, choice of story and scene settings, pacing, and any literary elements you employ, such as suspense, tension, symbolism, and plot twists. Remember, when making developmental edits you're looking to refine your story into a gem worthy of publishing. That means ensuring that each element of your novel serves a strong purpose. If it doesn't, it probably needs to go. Next up is line editing. This type of editing requires you to take your rough draft and turn it into something that actually sounds like a novel. Daunting, right? Let's take it slow. When you line edit your novel, you're going to work through your manuscript line-by-line (le, duh...) in an effort to smooth your prose, fix any continuity errors or other mistakes, and clarify your story for reader understanding. This task is certainly time-consuming. If you're more of a storyteller than a technical writer, line editing will also prove to be a task that seriously tests your patience (and maybe even your self-confidence). But no matter what line editing throws your way, remember that it is just another step in your self-editing journey. Keep on practicing, and you'll see your manuscript improve. The final type of editing is copy editing. This consists of a literal word-by-word revision process completed to combat those pesky technical mistakes. Though most authors choose to hire a professional copy editor to perform this round of edits, it is still a good idea to understand what goes into the process. With copy editing, you or your editor are going to look for improper grammar, spelling, and punctuation, as well as any formatting issues. You'll also keep an eye out for any passages of your story that aren't clear, concise, or comprehensive. Once changes have been made, your manuscript should be ready for publishing! This breakdown should give you a strong understanding of what goes in to editing your novel for success. But how can you create a game plan to help you see these tasks through? Get started with my brand new e-course, Self-Editing Success. 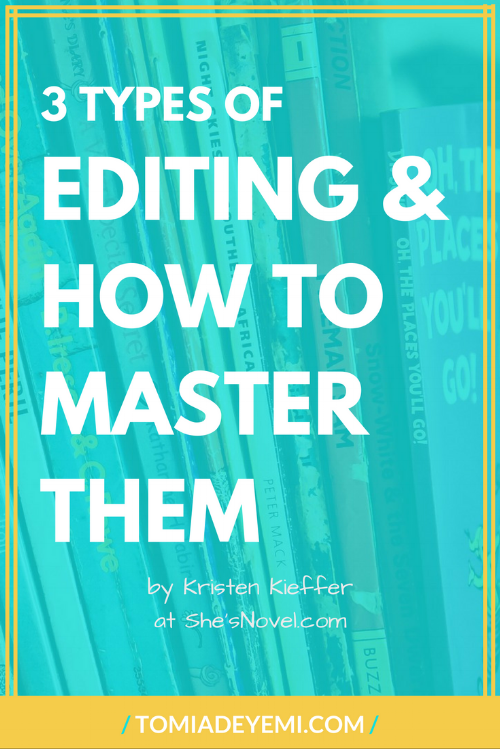 This amazing manuscript editing course will walk you through the process of editing your novel for bestselling success using 19 proven strategies. You will master the three types of editing, refine your manuscript, collaborate with experts, and prepare to achieve your publishing dreams! The pre-sale and early-bird pricing is happening now through February 14th, so make sure to click on over for more information and to purchase the course while it is at its lowest price ever. So what do you say? Come join the epic editing party! Enroll in Self-Editing Success today.